Tuesday to Friday except holidays. 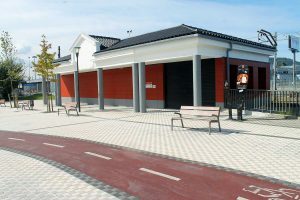 The centre has a reception offering tourist information about the three towns and also have an exhibition area with informative panels about: Bidasoa biodiversity, the Eurovelo network and the part of the Way of St. James that crosses Irun. In the exhibition area, Bidasoa is shown to be a true meeting point and “a country named after a river”. There is the history of the customs post, the importance of the area as a strategic enclave, the Way of St. James as it crosses the area and the Eurovelo route which has its Bayonne-Pamplona section information point here. The exhibition area also projects videos about the flora and fauna of this area. This is the only center of its kind within the large netwok of European Union cycling routes. It is managed by the Bidasoa Txingudi Cross-Border Consorcio.